Jay-Z performs D.O.A. at the 2009 BET Awards in June. When Jay-Z penned the recently released D.O.A. (Death of Auto-Tune), increasing the sales of said software probably wasn't part of the plan. However, developer Antares has suggested that that's exactly what's happened. The video for D.O.A. goes so far as to feature a pile of Auto-Tune boxes being blown to smithereens, but according to Antares Vice President of Marketing Marco Alpert, this negative publicity hasn't been a problem. "The Jay-Z controversy is great," he told The New York Times. "We couldn't buy PR like this." 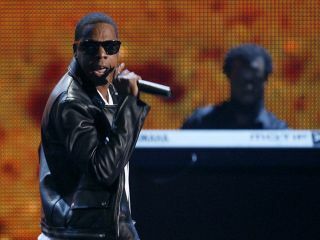 Although Alpert didn't quantify the impact that the rapper's diss has had on sales, the implication is that it's been positive. Speaking about the current vogue for using Auto-Tune at extreme settings (see T-Pain, Lil Wayne and Kanye West), Alpert added: "We make no value judgments on how people use our product. It's a tool to be used by the people who buy it, and we're happy when consumers find new uses for it. "We really didn't foresee that the trend [for extreme use] would last as long as it did." Nor did we, but thanks to Jay-Z, it might just last a little bit longer.